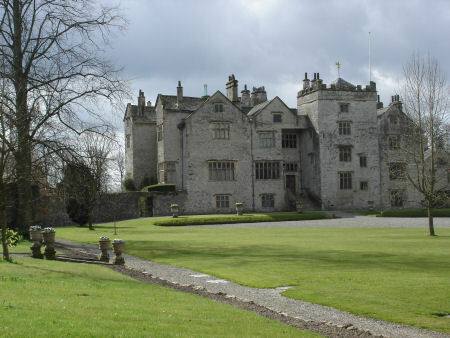 Levens Hall is a manor house in the county of Cumbria, a building has existed on the site since the first Pele Tower - which was a small fortified keep or tower - in around 1350. Most of the building which stands today is from the Elizabethan-era and more of the additions were made in the late 17th and early 19th centuries. The hall is owned presently by the Bagot family and is open to public access with it's main attraction being the topiary garden which was started in 1694. Possibly the Hall's most famous apparition is that of a small black dog, it's been reported numerous times appearing right beneath people's feet and as soon they try not to step on it, it vanishes... Another ghost is the hall's grey lady (yes, every old building has one!) It's told that she is the ghost of a gypsy woman who was turned away from the house when she needed food and shelter because she had no money. Having been turned away she left a curse which said that no son of the family would inherit until the year the River Kent did not flow, and a white fawn was born in the park. The curse seems to have been effective, for indeed, no son did inherit until 1896 when both the river froze over and a white fawn was found in the grounds.